Say goodbye to your spider veins with laser vein removal! 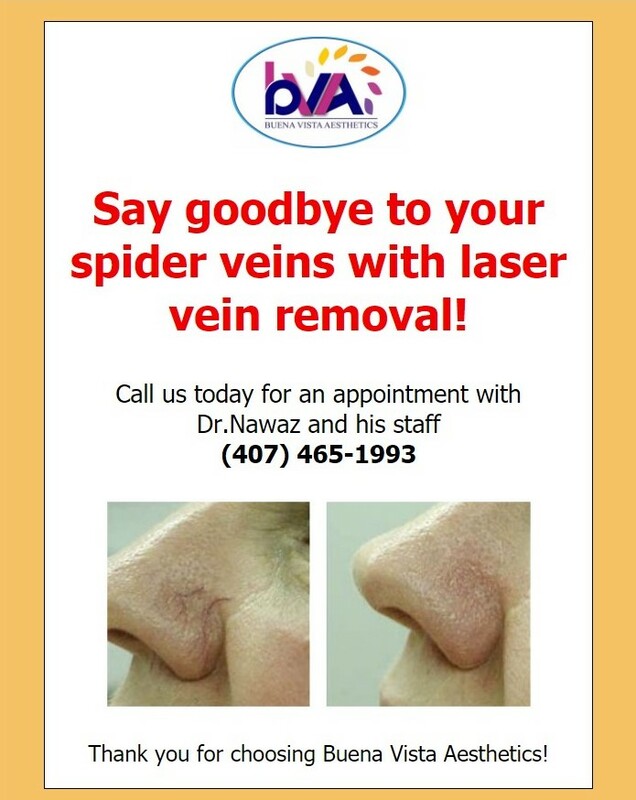 Spider veins are very small veins caused by dilatation of the small venules under the skin. This occurs when the pressure inside the vein increases enough to overcome the normal resistance of the vein wall. These can be removed with a single treatment. What kind of veins and conditions can be treated? Angiomas often called cherry angiomas because of the red appearance. The broken blood vessels give them their characteristic red appearance. Telangectasia: small abnormal dilatation of blood vessels near the surface of the skin. Commonly found in the nose, face, or legs. Port wine stains: reddish purple birthmarks that often resemble wine spilled on the skin. Rosacea: chronic skin disorder characterized by red flushing, rashes, or inflammation. Mostly found in the nose, cheeks, forehead, and chin.